One Legal — How do I add a user to my firm's One Legal account? How do I add a user to my firm's One Legal account? If you are an administrator for your firm’s One Legal account, you can add a new user by following the steps in this article. If you are not an administrator, you can find out which users in your firm are administrators or learn how new users can add themselves to your firm’s account. Log in to your One Legal account and click the My Account button in the upper right-hand corner. Click Firm Contacts from the list of links, then click the Add Contact button. Complete the Contact details form. If you select "Attorney" for the user's job role, you are required to enter a Bar number and State of record. Be sure to do this if you want to be able to select this person as the filing attorney when placing an order. 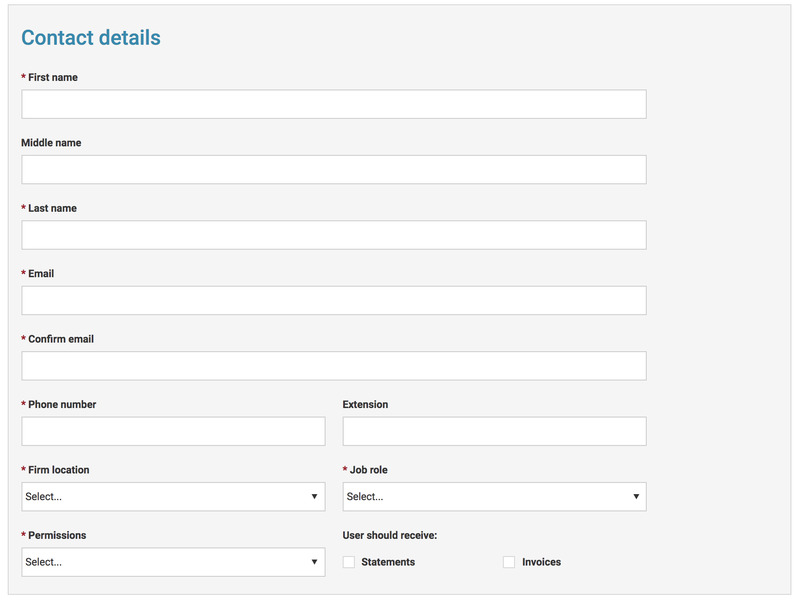 After completing the form, save it by clicking the Add Contact button. A confirmation message lets you know the user has been added successfully and gives you option to add another user. The user will receive an email with an account verification link. Once they click the link in that email and create a password their registration will be complete. Note: Attorneys must complete this final registration step before they will be available for selection as a filing attorney on your orders. Learn how to confirm that they've done so. What happens if the invited user does not receive the email invitation? How do I know if the invited user has completed the registration process? How do I view all transactions placed on my firm's account? Our award-winning customer support team is here to help.